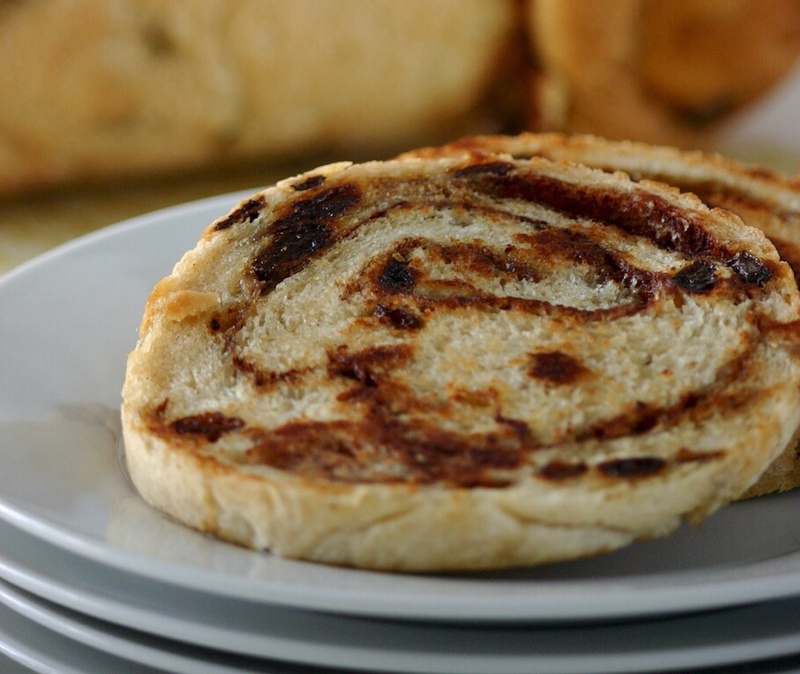 Cinnamon raisin bread has always been a guilty pleasure of mine. There is nothing like the aroma of cinnamon filling up the house on a Sunday afternoon, and definitely nothing better than fresh bread still warm from the oven. 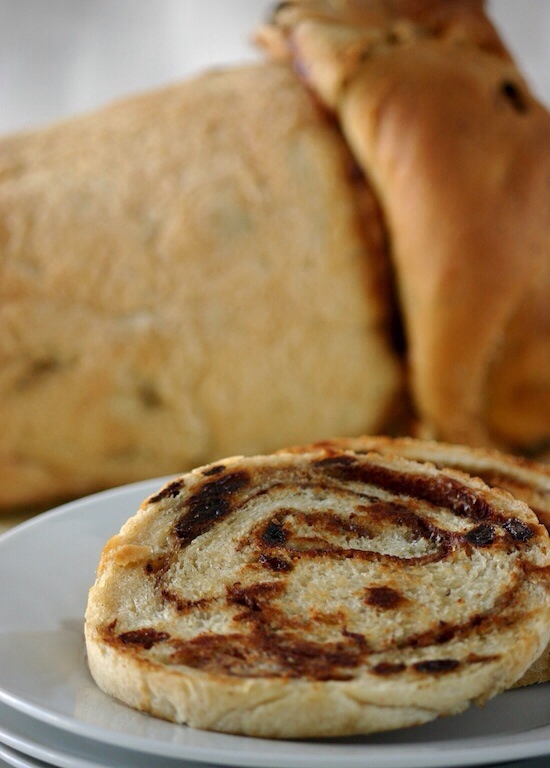 Cinnamon raison bread always bring me back to my childhood. When i was younger my family lived out in the burbs and my primary/elementary school was in the city, which meant no bright yellow busses. My Dad would wake me when it was still dark out and drive me into town on his way to work where i would spend my morning at the schools daycare. The best part was always breakfast. before we left the house Dad would always make me breakfast as i sat at the kitchen island half asleep. If we were lucky enough to still have a loaf of cinnamon raisin bread in the fridge (it didn’t last long in our house) he would butter both sides of a couple of slices and toast them in a frying pan until golden. In a small bowl, sprinkle the yeast and a pinch of sugar over 1/2 cup of the warm water. Stir and set aside until foamy about 10 minutes. In the bowl of a stand mixture fitted with paddle attachment, combine remaining water, non-dairy milk, 1/4 cup melted margarine, salt, flax mixture, and 2 cups of flour. Mix on medium speed until smooth and creamy, about 1 minute. Add thee yeast mixture and 1/2 cup of flour and mix for 1 minute until incorporated. Add raisins, cinnamon, and 1/2 cup of flour and mix to combine. Switch to the dough hook and continue to add remaining 2-2 1/2 cups of flour until the dough is smooth and elastic, and pulling away from the sides of the bowl, about 4 minutes longer. Place the dough in a greased bowl and turn to coat. Cover loosely with plastic wrap and let rise in a warm place until doubled in volume, about 1-1 1/2 hours. Lightly grease the bottom and sides of two loaf pans or bread crocks and set aside. In a small bowl mix the brown sugar and cinnamon until uniform and set aside. Turn the risen dough onto a lightly floured surface and divide in half. Using a rolling pin, roll each half into an 8×12 inch rectangle. Brush the surface of rectangle with the remaining tablespoon of melted margarine and sprinkle with the filling mixture leaving a 1 inch border free off filling on all sides. Fold in both long sides of the dough, about 1 inch, and begin rolling at a narrow end, tightly rolling each rectangle into a compact log. Place each log seam side down into the prepare pans. Cover loosely with plastic wrap and let rise in a warm place for 1-1/2 hours, or until the dough has risen 1 inch above the rim of each pan. Preheat the oven to 350°F. Bake until golden brown and the loaves pull away from the sides of the pan slightly, about 35-50 minutes. Turn out onto cooling racks and let cool completely before storing. Bread can bee stores, lightly wrapped at room temperature for about 4-5 days. Note: Baking times will vary based on thee type of pan used. Metal pans should bake in approximately 35-40 minutes, glass in about 40-45 minutes, and stoneware in about 45-50 minutes. If you are unsure as to whether or not your bread is cooked all the way through, you can verify by inserting an instant read thermometer into the center. The thermometer should read approximately 200°F.